One good place to start the plot would be the Mumbai office of ABN Amro Bank. A bank executive pays a visit to the office of Tuli’s Osian’s Connoisseurs of Art (Osian’s) almost every other day to recover money that the firm owes several wealthy clients of the bank who invested in an art fund sponsored by it. The dues are more than Rs. 40 crore. The bank has so far managed to extract some of that money. A lot remains. (ABN Amro declined to discuss the case with Forbes India but said it will review any client complaint and investigate). Neville Tuli, the flamboyant chairman and managing director of Osian’s, needed about Rs. 115 crore to repay investors in Osian’s Art Fund – Scheme Contemporary 1, when the three-year scheme matured in July 2009. Unfortunately, a global recession froze the art market, landing Osian’s in a liquidity crisis and left the close-ended art fund marooned with unsold inventory and a cash shortage just around that time. Soon, word spread that Tuli’s art fund wasn’t able to pay off investors at its close. This set off a reaction among the art fraternity, beating down the prices of the works of marquee names such as M.F. Husain and F.N.Souza in the fund’s portfolio. Surely, Tuli has told banks such as ABN Amro and BNP Paribas that referred their clients to the fund that it was only a “delay not default” caused by the art market reversal. But he isn’t getting too many backers to cut the delay. Bankers, for instance, have rebuffed Tuli’s attempts for a bail-out on the grounds that Osian’s is already over-leveraged and its cash flows have shrunk. “Neville Tuli has come to us several times over the past few months for money. We will not lend him one rupee more,” says a top banker who had lent handsomely to Osian’s in the past. Tuli had told Forbes India on January 16 that the art holdings of the fund have now been sold and the firm is awaiting payment from buyers. In an email to Forbes India just before this edition went to press Tuli said that out of 656 unit holders in the fund, two batches of 59 unit holders would have been paid by 25 January 2010 (a total of Rs. 15.3 crore), and all others have been paid. Forbes India could not independently confirm this. Meanwhile, he has also raised money from other sources. He raised over Rs. 9 crore last May by selling shares in his company (the fund’s sponsor) to Reita Gadkari, a London-based investor, at a premium of Rs. 1,240 per Rs. 10 share. He even borrowed money from private financiers at interest rates of up to 30 per cent to meet payments. As things stand, the financial picture looks bleak. While Osian’s has not yet filed its accounts for the year ended March 2009 with the Registrar of Companies (RoC), Tuli’s email says that as of 31 March 2009, revenues were Rs. 68 crore and the company made a loss of Rs. 19 crore. Its total debt was Rs. 109 crore. Estimates based on due diligence done by KPMG for Dubai-based Abraaj Capital, an investor of Osian’s, reported Osian’s debt as Rs. 133 crore for the same period. The impact of a bearish art market is only a facet of Osian’s problems. There are several others. Osian’s most high-profile investor, Abraaj Capital, has filed a suit in London’s commercial court to recover $23.7 million it gave Bregawn Jersey, one of Tuli’s offshore companies, to seed an international venture called the India Asia Arab Art Fund. Meanwhile, Osian’s most ambitious project, Osianama, an art conservatory and pop culture museum, is yet to rise from the flat piece of land in Central Mumbai where the famed Minerva theatre once stood. In due course, many would buy that dream and Neville Tuli would gain a reputation as a magnet for investors. The list of investors in Osian’s Connoisseurs of Art reads like a roll-call of the art appreciation elite in India: Sanjeev Khandelwal of Khandelwal Laboratories, industrialist Gautam Thapar, Citibanker Pramit Jhaveri, Sheshasayee Properties of Kumar Mangalam Birla, Priya Paul of Apeejay Surendra Group, HCL Corporation Ltd., Roshni Nadar, Gates Foundation’s Ashok Alexander, celebrity cook Tarala Dalal, MphasiS founder Jaithirth Rao, Kamal Morarka of Gannon Dunkerly and Sangita Kathiwada are just some names. Yet, when he broke into the art scene, Tuli was virtually unheard of. “There was a striking, slim, young man with a magnificent head of hair, and he kept putting up his paddle at the drop of a hat. He was surrounded by a bevy of young ladies egging him on. We wondered who this young man was. He was simply not known in Bombay,’’ says artist Jehangir Sabavala of Tuli’s early days. Tuli was in his early thirties when he came to India about 15 years ago. The Indian art market in the mid-Nineties was notoriously inefficient. Dubious practices and grey dealings dominated the scene. And the playing field was small. Even in 2004, the Indian art market was barely worth Rs. 50 crore. Tuli started with a charity for Indian art called HEART (The Tuli Foundation for Holistic Education and Art), which helped him connect with artists, collectors, dealers, and galleries. 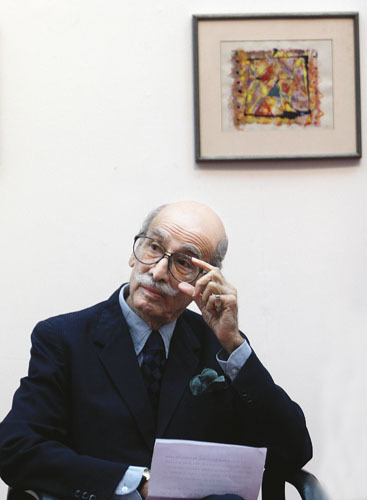 Pheroza Godrej, owner of Cymroza Gallery and a well-known figure in high society, says that her gallery effectively launched him. Many people say that Tuli has a knack of making friends, and foes, in elite circles. Sangita Kathiwada, socialite and chairperson of Cabochon Arts, a crucial cog in Tuli’s business, remembers that when he came to India after studying Indian art and architecture, he set out in search of people committed to the arts and Indian culture to support HEART. “He always says heart first and mind later,” she recollects. “We opened a cute little gallery called The Window, as a non-commercial gallery in a space I had outside Melange. The idea was to allow people the enjoyment of looking at art while learning from it,’’ Kathiwada claims. Tuli then produced a book called The Flamed Mosaic which brought him instant celebrity status and gave him a foothold in the art world as a serious player. Even today, many regard it as the most definitive book on Indian contemporary art. The local glitterati noticed him immediately as he bid aggressively at auctions and held forth passionately about art and culture at social dos. One socialite industrialist says Tuli always moves in the charmed circle of the rich and famous, giving lectures on art and culture at every opportunity. Tuli understood that as the country’s economy flourished, a wave would wash the art market too. He wanted to ride its crest. The strategy was simple ­­— own as many artworks as possible before the market exploded and also create hype for unknown artists and obscure memorabilia such as movie tickets sold 50 years ago. He started with the intention of bringing fame and value to obscure artists whom he owned and believed should be on the world stage. An industrialist, also an art aficionado, says that at auctions he would be waving his paddle about furiously which, he felt, was rather uncool. He adds that Tuli used to get high society women to host him at pre-dinner parties where he would “instruct” them on art. “That’s how he started getting all his contacts together,” he says. As Tuli slowly worked his way into the exclusive club of India’s elite, the roll of dice started turning against him. He gave up charity pretty soon. At a HEART auction in 1999, Tuli put up some old works of art with the assurance that two experts had certified their provenance or the history of their origin and ownership. It was later found that he had never even showed them the works. Given that certified provenance confirms the authenticity and legality of a work and can fetch higher prices, this controversy was a serious one. But Tuli terms the allegations “absolute nonsense and lies” insisting that it was HEART that introduced the concept of provenance in India. However, that was to be HEART’s last auction. “I realised charity was ineffective, and I had to bring economics to the centre of it. I wanted to create the greatest arts and culture institution in the world and it needed to have financial independence,” he says. 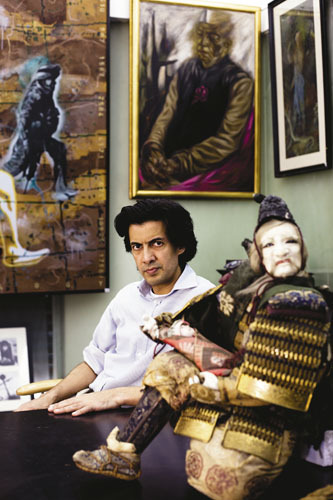 After HEART failed, Tuli founded Osian’s Connoisseurs of Art in 2000, which runs a self-supported auction house that expanded to include art advisory services, a film house, publishing and design house, a centre for archiving Indian, Asian and Arab art, and even own a Durand cup football team, the New Delhi Heroes, besides sponsoring the cup tournament itself. Though these projects got him admiration, the business model did not make sense from the start. The auction house was funding everything. His expansive ventures got him the headlines, but money was still a trickle. Osian’s was simply not in the big league. It needed to expand fast to be prestigious and influential in the art world. But Tuli thought it was growing too slowly and started weaving much bigger plans. By 2005-2006, Tuli’s company had reported revenues of Rs. 65 crore and a healthy profit of over Rs. 11 crore. An ambitious Tuli began eyeing a global play with a subsidiary and its first office in Dubai. “It is expected that by 2009-2010, Osian’s (consolidated) profit after tax will reach approximately Rs. 110 crore on an expected revenue of Rs. 460 crore,” he forecast. Osian’s sold shares to two strategic investors at Rs. 1,400 per share that year. Two years later, Abraaj Capital invested $20 million at Rs. 1,600 per share for a 9.4 percent stake. The company set the quarter ended March 2009 as the target date for a public share issue. In June 2006, just when the stock market was down but the art market peaked, Neville Tuli announced the launch of an art fund amid an economic boom. All markets were awash with liquidity. The art market was estimated to be growing at nearly 100 per cent. A clutch of banks led by BNP Paribas and ABN Amro referred their wealthy clients to buy units in Osian’s Art Fund and in return got hefty fees of up to 20 per cent in some transactions, according to a person who was involved with the issue. The banks together earned nearly Rs. 5.5 crore. The fund raised an unprecedented Rs. 102 crore. Tuli’s networking ability brought to the board of Osian Art Fund’s asset management company names such as Gautam Thapar, Ashok Alexander, Lord Meghnad Desai, corporate lawyer Cyril Shroff and Pramit Jhaveri. One of the directors of the trustee company was former Securities and Exchange Board of India chairman D.R. Mehta (Mehta quit in January 2008), the first annual report of the fund says. The company did not spare any expense in selling the fund as it overshot the 5 per cent limit for issue expenses by a mile. It ended up spending a total of Rs 6.3 crore as initial expenses, the surplus borne by Osian’s. More than 650 investors spread across 39 cities bought units in the fund. That year, Osian’s rewarded its Chairman and Managing Director Tuli with a gross remuneration of Rs. 3.2 crore. He had earned a little under Rs. 70 lakh the previous year. He bought a house on Mumbai’s tony Carmichael Road from actress Sharmila Tagore with a Rs. 5 crore bank loan underwritten by Osian’s. Neville Tuli had suddenly become a high roller. Tuli went on an art and artefacts buying spree. Gone were the days when he scoured the country for hidden treasures that could be bought cheap. He spent millions on Japanese Samurai masks and James Bond memorabilia. Tuli says that Osian’s has the largest collection of Hollywood memorabilia anywhere in the world. According to him, the firm owned more than 2.65 lakh pieces of art, objets d’art and pop memorabilia. Art funds look very much like mutual funds but differ in a key detail. Regulation. Stock market regulator SEBI had indeed brought out some recommendations to regulate art funds, but they were never finalised. Art fund managers were free to operate like cowboys. Initially, Osian’s art fund appeared to be a thumping success with its net asset value (NAV) racing to Rs. 121 in February 2007, barely six months after closure. Its total corpus was invested in 146 artists, the top 20 of whom included masters such as V.S. Gaitonde, F.N. Souza, S.H. Raza and M.F. Husain. The first disclosure report said the 20 comprised three-fourths of the value of the Fund. The NAV of the Fund’s units rose to Rs. 138 within two years of launch before falling to Rs. 128 in January 2009. By the time the scheme matured in July, it had fallen to Rs. 112. In the euphoria of the previous years, investors were, however, blind to one small detail tucked away in the notes to the accounts. It said: “In the absence of a regulated active market, the net realisable value has been estimated on the basis of management’s expectation thereof, taking into account, where applicable, prices of similar paintings sold during the period.’’ That meant Neville Tuli practically decided the value of the stock as he had hand-picked every piece of work. Although the value of a piece of art is always debatable, there is a reasonable price range that experts forecast. Lovers of art may pay any price, but not investors looking for returns. “He pays exorbitant rates for things he doesn’t need to. He buys artwork and doesn’t pick it up. With Neville, nothing makes sense,’’ says a person from whose firm Tuli has purchased art. The valuations were based on an art index. It is another matter that the index was also created and managed by Osian’s in association with The Economic Times, a financial daily owned by the Bennett, Coleman and Company that is an investor in Osian’s. In a mutual fund set-up, these would have been clear conflicts of interest. But then, unlike mutual funds, it helps that art is unregulated in India. “It appears to me there is an issue of transparency here. As an auction house, you don’t sell art from your own stocks. The integrity of the process can get breached and [it] gives rigging a chance. Naturally these things get noticed and you lose respect,” says Harsh Goenka, one of India’s leading industrialists and a prominent art collector. While Osian’s set up the fund, it also shared its director with the asset manager. Its auction house bought and sold art on behalf of the fund. Cabochon Arts, a dealership set up by Tuli and transferred to his close friend Sangita Kathiwada (who is also a shareholder in Osian’s) and her son Digvijay Kathiwada in 2007, has had extensive dealings with the fund through the auction house. Tuli’s mother Swaraj Tuli was a director on the company’s board even in December 2007. The company’s email address continues to be hq@Osians.com even though it has moved its registered office from Osian’s Nariman Point premises to Napean Sea Road in Mumbai. Two KPMG officials, who conducted a due diligence on the company on behalf of Abraaj Capital, describe Cabochon as a company over which Tuli has indirect control. The officials, who titled their report of July 1, 2009, Project Picasso II, say the company did not give them details of purchases and sales from the fund and hence they could not comment on the arm’s length pricing. Tuli turns the logic of such conflict of interest on its head. “Osian’s is everything in one cup, because, unless you have synergies you can’t do half these things. If the art fund does not have the expertise of an auction house… if we did not have the suppliers, access to the clients… if we did not have all that knowledge, we can’t run the art fund. It’s impossible.’’ But what is haunting him now is another statement he made to investors. “Time will now show whether we can carry this responsibility and fulfil the promises to our investors,” he had written in the fund’s first disclosure report in early 2007. That time came in the middle of 2009 when the fund closed, but Tuli failed to keep his promise. Used as they were to fancy NAVs, investors were just about digesting the fall in the market but at least expected to be paid what was due. But for five months, even that didn’t happen. Finally, Osian’s told investors that it would send out cheques in December second week. However, it managed to pay only a few investors, that too only 85 per cent of their principal. Tuli then told the two foreign banks that had referred the fund to their clients that he would not be able to meet the deadline. But he assured them that he would pay. The unravelling of the world’s second biggest art fund had begun. “If I were an investor in such an entity, I would take whatever money I can recover and run with it. 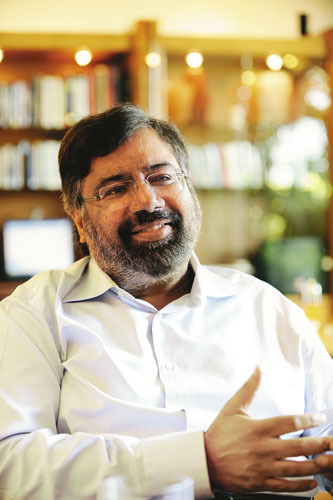 At the moment, things don’t seem to be all right,” says Goenka. Investors hadn’t got early warning. Even as the market fell, optimistic valuations by the Osian’s management of the art it owned and its ability to sell it in a falling market kept the NAV of the fund much higher than what could have been its actual market value. Tuli now admits that the NAV might have been out of sync with the market. While the NAV trap tightened, Osian’s, the company, was gasping for cash liquidity as revenues from the auction house dried up. It used up its entire working capital and overdraft lines of about Rs. 55 crore with a slew of banks during the year. Its bank loans increased from Rs 65. crore in March 2008 to Rs. 106 crore a year later, according to Project Picasso II. The report says that the cash crunch was so severe that the company could not pay loan instalments, statutory dues, overdue creditors, keyman insurance premium and even salaries in Delhi. In his latest email to Forbes India Tuli also said that the ICDs were very short term borrowing against incoming funds, and that they had the option to be converted into sale of art after a fixed date. The situation became even worse because Osian’s operates on a level of receivables that is unusual for companies. One banker says that Tuli asked for a loan repayment to be postponed because Osian’s’ clients were not able to pay. The KPMG report said various entities and individuals owed Osian’s more than Rs. 100 crore, more than a third of which was owed as advisory fees for setting up the India Asia Arab Art Fund (IAAF). Of the $16 million that IAAF owed, Osian’s had already accounted for about $4 million as revenues in fiscal year 2007-08. It had accounted for the rest as receivables in the next year. The ambitious international venture not only sullied Osian’s books, it also landed Tuli in trouble with both Abraaj Capital and international auction house Christie’s. Tuli’s offshore company based in Jersey Isles was acting as the purchasing agent for IAAF and had accordingly signed an agreement with Abraaj in June 2008. The June agreement listed a total loan of about $23.7 million to Bregawn in the previous month. Abraaj has moved a London court to recover that money for which Neville Tuli has also given a personal guarantee. Tuli says that Bregawn was acting only as a purchasing agent for Abraaj, which bought the art with the intention of selling it to IAAF. The Osian’s Art Fund had an option of selling its Modern and Contemporary art collection to IAAF if it was launched. Bregawn landed Tuli in another soup too. Auction house Christie’s has reportedly held on to art worth almost a million dollars that Tuli purchased for Osian’s because Bregawn owed it millions of dollars. Osian’s recently moved court to prevent Christie’s from re-auctioning the art works. Osian’s, according to reports, claims Bregawn is a separate company and, therefore, not responsible for that company’s liabilities. Neville Tuli cannot ring-fence Osian’s or Bregawn, a source says, because he is the face for both, a view Christie’s has also taken. Another source close to international auctioneers says that auction house Sotheby’s too came close to suing Osian’s last year for an $8 million payment. The source said Tuli bought art but never paid for it. “Sotheby’s has now received a partial payment from one of the Neville Tuli companies in respect of the amounts due to Sotheby’s. A substantial debt to Sotheby’s remains and Sotheby’s is holding art property as collateral against this debt. Sotheby’s will not be commenting on the precise details but even collectively, Neville Tuli’s companies have not paid US$8.8million for any property,’’ Mathew Weigman, worldwide director of sales publicity at Sotheby’s, said. However, at the time of going to press, Sotheby’s had not moved court. He had also said Osian’s had not bought anything at Christie’s. The day after the interview, he sent a list of creditors, including 13 galleries. The list puts Osian’s’ total outstanding debt at Rs. 10.5 crore, of which Rs. 6 crore is owed to auction houses, specifically Rs. 3.3 crore to Sotheby’s. It did not list any debt to Christie’s. When Osian’s Art Fund was launched, an advisor with a foreign institutional investor concluded that it was too risky to bet on. He argued that the total value of transactions in the art market had been Rs. 50 crore in 2004, Rs. 225 crore in 2005 and Rs. 311 crore in 2006 until June. There were only 12 paintings in Indian contemporary art until then to have fetched a value in excess of Rs. 3 crore and 102 paintings in the previous two years to have crossed Rs. 1 crore. “The market seems to be quite small for the size of the fund,” he wrote to his bosses. The advisor’s observations turned out to be uncannily accurate. Osian’s Art Fund was a big fish in a small pond. Now the pond has little water and Osian’s is struggling for breath. A perfect existential conundrum for a Dostoevsky novel. Sanjeev Khandelwal, one of the directors of osian, should be sued by investors and the public. He took out all his money from osian before it crashed and publically told everyone to buy into osian. He cheated his own friends and relatives. He also runs a small pharmaceutical company and pretends to be a venture investor. Anybody doing business with this guy should be aware, he will cheat you and is a big fraud. OSIAN was his scam idea with Neville. I happen to meet one of the employee of Osians and he told me that the company has not paid him salary since last 8 months!! just think a company who is treating it's employees as it's slave and not paying even salaries or can't even afford to pay salaries to its staff, how come will it pay to it's investors?? I havent yet got a dime back from Osians. Can't understand how they could pay 85% to some of the investors while depriving the others 100% . Is there any legal recourse available ? How bout the glitterati in the board of directors , can they be of any help at all? Haven't even received part redemption. I would say investors who have received 85% of the corpus are very lucky indeed. I feel cheated. Can anybody help ? I am also an investor in Osian Art Fund. Please include me in the fight to recover our hard earned money. I did receive 85% of the corpus more than a year ago. Since then, only promises but noting else. I have retired and need these funds urgently. Thanks. As of today, Neville has paid only 85% of the corpus. Remaining 15% and the (meagre) profit is yet to be received, which he and his staff have been promising since December 2009 end. In spite of the Auction held in Mar 2010, he has not yet paid up the investors. He is heard to be sitting on a highly valued art collection but it seems wishes to raise his hands to pay up the investors. For every con man a sucker is born every minute. Since when did Forbes start taking up issues of personal vendetta? Elizabeth i believe was not glorified as a journalist and treated on par with others when she walked into Osians the first time round! is that the reason for the article? i also heard that Osians was aware of the article and Mr. Tuli allowed the article to be printed because he believes in democracy!!! This is business not glorified philosophy we are dealing with!! ups and downs are natural here just as the vultures who swoop down on those who fall! Lets see Forbes' democracy now!